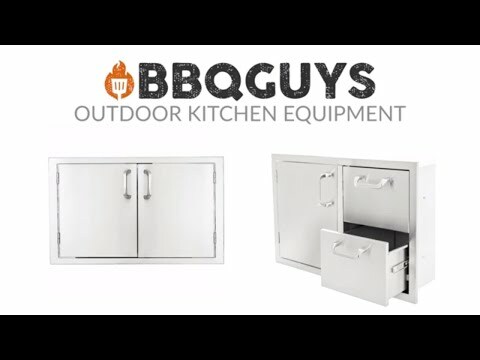 This BBQGuys Single Left-Hinged Access Door & Double Access Drawer Combo features commercial 304 grade, stainless steel construction, and a 20 gauge steel frame; external flag hinges on door for easy removal; heavy duty commercial grade ball bearing drawer glides; full length drawer tracks; and a number 4 brushed finish. Door is open for island access. Drawers are fully enclosed. Unit is flush mounted. This door & drawer combo does not include installation hardware or instructions. Cut Out Width 28 1/4"
I looked at many competing suppliers, the BBQ Guys easily had the best selection and prices. [...] installed it and continue to receive complements from all who see it. The previous reviewer who said the product seemed 'cheaply made' is WAY off base! For the price, the quality is excellent, drawers runners are all SS w/ball bearing guides. Best buy out there!! I'll be doing more business with BBQ Guys. 28 1/4" 37 5/8" 30 1/4" 28 1/4"
19" 19 1/2" 19 1/2" 19"
21" 20 5/8" 20 3/4" 21"